As the country debates what form Brexit will take, it has become common in parts of the liberal-left to argue that European freedom of movement must be abandoned for ‘socialist’ reasons. The argument goes that large numbers of EU workers in the UK creates intense competition for, particularly ‘low-skilled,’ jobs. This enables employers, in turn, to keep people on precarious contracts and pay them at, or even below, minimum wage. There are many obvious problems with this reasoning. The rise of precarious, low-waged work is the result of neoliberalism, not immigration. While acknowledging this, the ‘socialist’ case against freedom of movement is premised on the idea that if there were fewer immigrants, the pool of available workers would decrease and remaining workers would be in a better bargaining position. This ignores the employers’ responsibility for perpetuating exploitative working conditions, placing the blame on workers for ‘accepting’ these conditions instead. It also ignores the fact that many migrant workers do not accept these conditions, and have been at the forefront of campaigns for better wages and working conditions enjoyed by all workers; the recent, successful Deliveroo strike being a perfect example. At the same time, studies from LSE and the National Institute of Economic and Social Research have shown that immigration doesn’t have much effect on the ratio of available workers to available jobs, because, as explained on a recent #NovaraFM podcast, the presence of immigrants actually creates jobs. Repeated studies have shown the effect on wages to be statistically insignificant. While it seems counter-intuitive, immigration controls provide employers with a reserve army of highly vulnerable, easily exploitable labour, thereby facilitating precarity across the job market. Reducing legal immigration would not increase the number of available jobs per legal resident of the UK. However, it would likely increase the proportion of the British workforce working ‘illegally,’ because they are either undocumented or documented migrants working in violation of their visa conditions. As should be obvious from the horrific rate at which migrants are drowning in the Mediterranean, immigration controls are not a deterrent, especially to those escaping dangerous situations. Some migration scholars, such as Bridget Anderson and Rutvica Andrijasevic, argue that it is better to understand immigration controls as a sorting system, which create different categories of migrants with different relationships to the state and the labour market. One such category is ‘illegal immigrants’ – people who, because they are ‘deportable,’ are precarious and have little recourse against exploitative employers. In the UK, penalties for undocumented working are weighted heavily against workers – if an employer ‘fails’ to check a person’s status, they may be fined, but ‘illegal’ workers may be imprisoned and will be deported. Recently, we have seen repeated examples of employers calling in immigration authorities to undermine industrial action taken by migrant workers. Certain groups of ‘legal’ migrants may be in a similarly vulnerable position, depending on their visa conditions. Asylum-seekers are not usually allowed to work but, as argued in Precarious Lives, the long wait for asylum cases to be decided, combined with the very low rate of asylum support provided by the government pushes asylum seekers into ‘illegal’ work, making them vulnerable to exploitation. Work permits are usually tied to one employer, meaning that a migrant may have to choose between leaving a bad job and remaining in the country. The stereotype of the ‘hard-working’ migrant must be considered in this light – failing to ‘work hard’ may result in being fired and deported. At the same time, many migrants, including – of course – the undocumented, have limited or no access to the welfare state. This makes them further dependent upon their employers, as they may be forced to pay for their own medical treatment, or risk destitution if they become unemployed. European migrants have comparatively more rights and more recourse against exploitative employers than most other migrants. If freedom of movement is ended, the overall ratio of available jobs to workers will not change; what will change is the proportion of UK migrants who are undocumented, or on a visa that limits their work options. As of 2009, a higher proportion of the UK’s migrant population was undocumented than that of most other EU countries. Therefore, far from protecting workers, further curbing freedom of movement will actually mean an increase in the percentage of UK residents who are vulnerable to highly-exploitative working conditions. Unethical employers may actually find their bargaining situation improved. Mandatory document checks at most workplaces will drive undocumented workers towards employers willing to ignore those checks. Those employers will expect workers to accept terrible conditions in exchange. And, if those undocumented workers do organise, those employers can call in the UKVI, resulting in the arrest of troublesome workers. Paul Mason’s suggestion that highly-skilled Europeans be allowed to come and go as they please while restrictions be placed on low-earners, is actually the neoliberal ideal: freedom of movement for a wealthy elite, and a reserve pool of low-income precarious labour that can be deported if they go on strike. The left must defend European freedom of movement, and work to extend it globally. Given the rise of xenophobia and racism, it is unconscionable that we would even consider conceding this struggle. Suggesting that there is a ‘socialist’ case for more immigration controls simply makes racism respectable. Furthermore immigration controls are a key strategy of neoliberal capitalism, creating a ‘reserve army’ of vulnerable, easily exploitable workers. 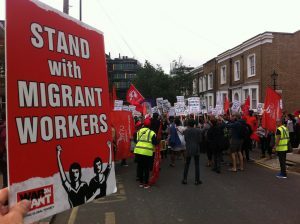 Instead, we must work to organise undocumented and other precarious workers; support these workers in their labour struggles; demand better regulation of the labour market, including a living wage and that the UKVI be prevented from intervening in labour disputes.